Abstract: Stroke is the second leading cause of death worldwide and the third major cause of adult disability in adults. Regulatory T-cells (Tregs) may exert a neuroprotective effect on ischemic stroke by inhibiting both inflammation and effector T-cell activation. Transplantation of human bone marrow-derived stem cells (BMSCs) in ischemic stroke affords neuroprotection that results in part from the cells’ anti-inflammatory property. However, the relationship between Tregs and BMSCs in treatment of ischemic stroke has not been fully elucidated. Immunocytochemistry (ICC) and flow cytometry were used to identify cells expressing phenotypic markers of Tregs: CD4, CD25, and FoxP3 protein. Tregs were isolated using magnetic sorting from murine spleens. Primary rat neuronal cells (PRNCs) were subjected to an oxygen-glucose deprivation and reperfusion (OGD/R) condition. 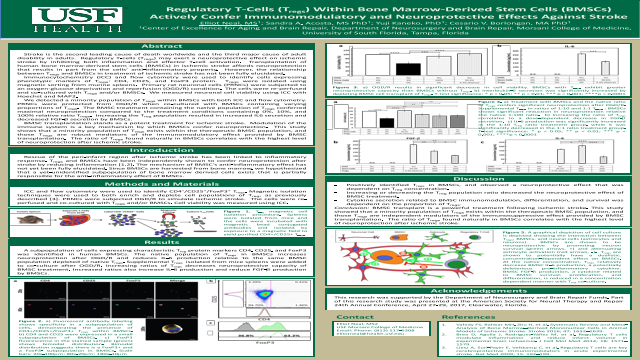 The cells were re-perfused and co-cultured with Tregs and/or BMSCs. We measured neuronal cell viability using ICC with Hoechst and MAP2. We detected a minority population of Tregs within BMSCs with both ICC and flow cytometry. PRNCs were protected from OGD/R when co-cultured with BMSCs containing varying proportions of Tregs. The BMSC treatment containing the native population of Tregs conferred maximal neuroprotection compared to the treatment conditions containing 0%, 10%, and 100% relative ratio Tregs. Increasing the Treg population resulted in increased IL-6 secretion and decreased FGF-beta secretion by BMSCs. BMSC transplantation stands as a potent treatment for ischemic stroke. Modulation of the immune system is a key mechanism by which BMSCs confer neuroprotection. This study shows that a minority population of Tregs exists within the therapeutic BMSC population, and those Tregs are robust mediators of the immunomodulatory effect provided by BMSC transplantation. The ratio of Tregs found naturally in BMSCs correlates with the highest level of neuroprotection after ischemic stroke.